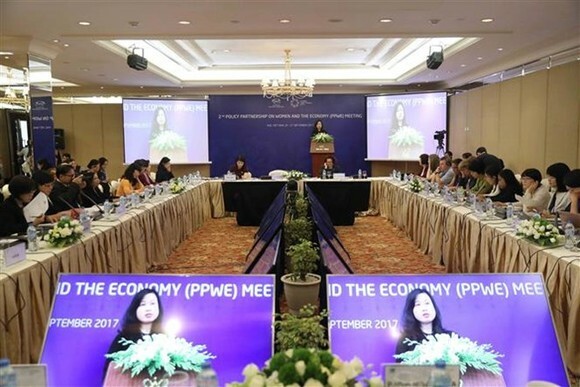 The second APEC Policy Partnership on Women and the Economy (PPWE 2) Meeting kicked off in Hue city, the central province of Thua Thien-Hue, on September 26 with the aim to continue promoting gender equality and women’s economic participation. The two-day PPWE 2 is the first activity of the 2017 APEC Women and the Economy Forum that lasts from September 26 to 29 in Hue. Opening the event, Vietnam’s Deputy Minister of Labour, Invalids and Social Affairs Dao Hong Lan said the building and implementation of gender responsive policies and programmes in APEC are necessary to enhance APEC forums’ coordination in gender equality issues and the inclusion of these issues in each forum for the sake of women’s socio-economic progress and gender equality in the region. "We do this to affirm that women have an important role and contributions to the economic development in APEC while helping to put forth equal approaches in terms of economy, labour and job for both women and men,” she added. She expressed her hope that the PPWE 2 will attain expected outcomes, including updating the progress of implementing and suggesting next steps for the realisation of PPWE’s strategic plan for 2015-2018, strengthening cooperation among APEC economies and working groups in the implementation of common initiatives, finalising and approving the APEC gender inclusion guidelines, and completing a draft ministers’ statement to be submitted to the High-Level Policy Dialogue on Women and the Economy later this week. The 2017 APEC Women and the Economy Forum is a chance for Vietnam and other APEC economies to contribute to common achievements and efforts, she noted, applauding APEC leaders’ recognition of the importance of women in the region. The forum focuses on enhancing women’s economic inclusion and empowerment in a changing world. Its priorities are promoting gender equality for inclusive economic growth, improving the competitiveness and creativeness of micro-, small- and medium-sized enterprises owned by women, and narrowing the gender gap in human resources development. Founded in 1989, the Asia-Pacific Economic Cooperation (APEC) with 21 economies is the Asia Pacific’s premier economic forum. The primary goal is to support sustainable economic growth and prosperity in the Asia-Pacific region. The APEC economies account for 39 percent of the world population, 57 percent of the world GDP and 47 percent of the global trade, according to statistics in 2014. The APEC Year 2017 is taking place in Vietnam under the theme “Creating New Dynamism, Fostering a Shared Future”. The country used to host APEC events for the first time in 2006.